The sugar crop - which started in December finished last week - and ASR/BSI reports that it produced a record amount of sugar. That's a total of 144,086 metric tonnes, eleven thousand more than last year, and two thousand more than the previous record set in 2015. And they accomplished this feat despite grinding about 23,000 fewer tonnes than last year. 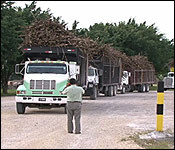 The increase in sugar production from less cane is owed to good cane quality, and improved factory performance, not to mention good weather for most of the crop. Despite the overall improvements ASR/BSI says in a press release that it is still concerned about falling world sugar prices, and an end to preferential access in the EU sugar market in October of this year.